We had a busy four-day weekend. My sister was here for the entire time, helping with Christmas prep. 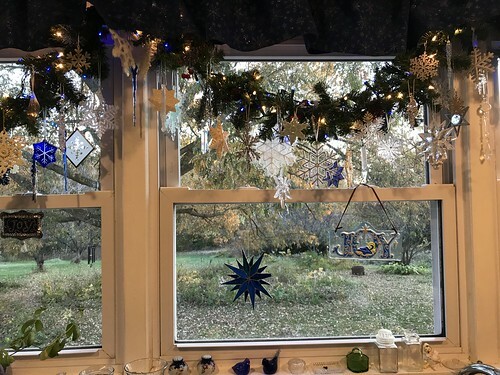 A friend came over on Saturday and put in hours of help with decorating Christmas trees and hanging snowflakes. She brought two of her helpful kids along to carry and tote and help as they could for an hour or so. Older Son and his wife were here all day Saturday, as well. And, of course, DH, who helps in so many ways. My grateful thanks to all of you! 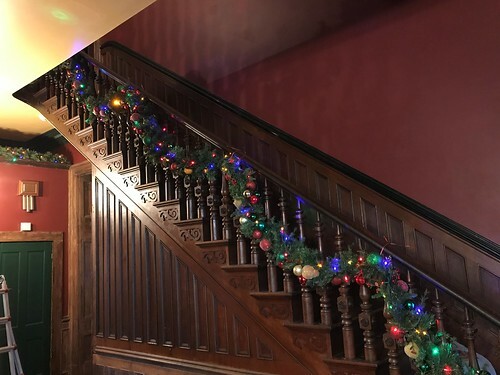 The staircase, before the bows were added. The grands were here Thursday through Monday. 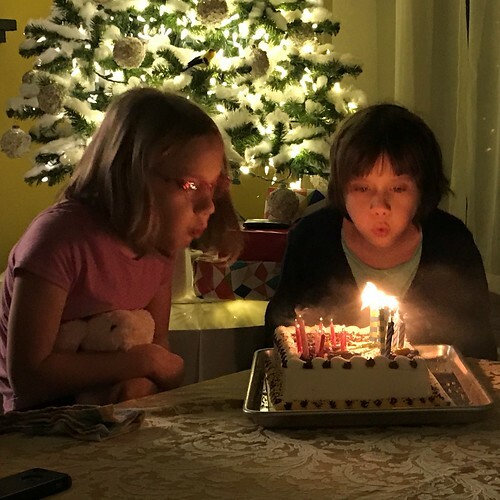 We celebrated their tenth birthday! Snow White did some decorating of her own. 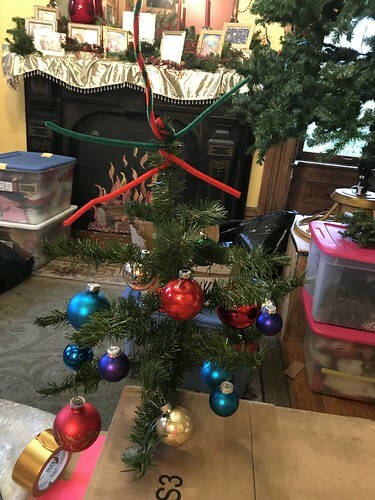 She used a piece of garland and some duct tape to make a tree. Then she decorated it with ornaments from the surrounding boxes and used pipe cleaners to make a star for the top! 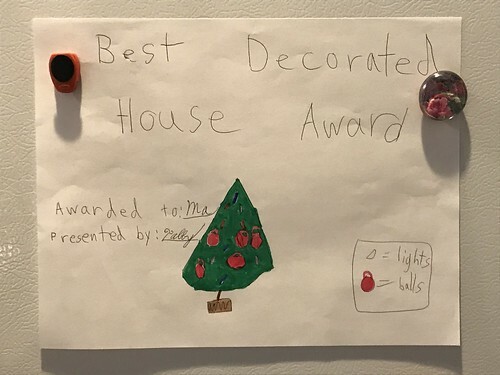 She also gave me an award! The next few weeks will be busy. We are prepping for our annual Christmas Open House, which will be Sunday, December 3. There is still a lot of work to be done. We have six small trees to decorate and the two largest ones are not yet decorated. I am still putting lights on the “glass” tree. It has to be entirely redone. It had quite a few nonworking lights strings this year. I decided to start fresh with all new lights. A huge job, but it will look better when I’m done. If I had to give up all my trees but one, I would keep the glass tree. 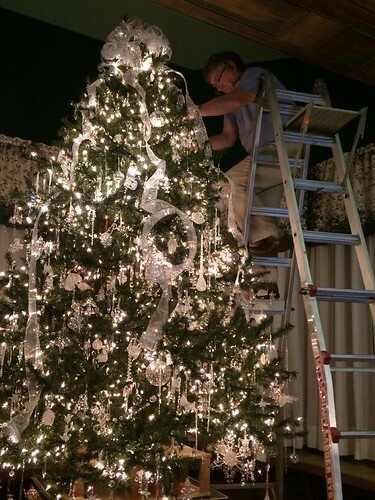 Here is a picture of DH decorating the top of the glass tree last year. The front hall is packed with boxes and there are storage containers all over the house. Just part of the process. When it’s done, we will have all of December to relax and enjoy it. For now, here is the menu for this week. I hope your menu is in place. Planning ahead makes mealtime much more simple than it is without a menu! Alton Brown’s Pot Roast A family favorite! This entry was written by ~~Rhonda, posted on November 14, 2017 at 10:44 am, filed under menu. Bookmark the permalink. Follow any comments here with the RSS feed for this post. Post a comment or leave a trackback: Trackback URL. Glass tree is also my favorite! The glass tree is absolutely amazing. I don’t think I have noticed it before, but I don’t know how I could have missed such a beautiful tree.